Our shared rooms are individually designed and feature our Premier Capsules—designed for comfort and build-in privacy. Each Premier Capsule comes with premium bedding, privacy screen, outlets and reading lights. Female-only rooms are available. A spacious individual locker and access to the hostel’s atrium balcony library and guest lounge are included with any shared accommodation. For private accommodations, each room also features a flat-screen TV and safety deposit box. Guests will enjoy a café lounge and workspace, 2 on-site bars, a rooftop restaurant, and daily continental breakfast. The property including all rooms are fully air-conditioned. Complimentary Wi-Fi is offered throughout the property. Tambayan Hostel is housed in an old Manila mansion from the 1940s in the city of Manila—home to Metro Manila’s oldest and most historic sites and major cultural attractions. 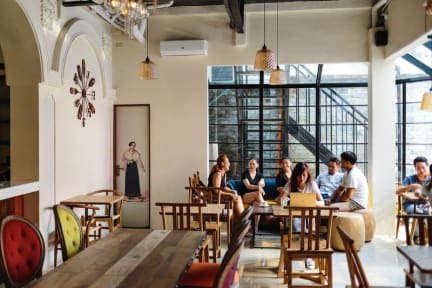 Tambayan Hostel guests can walk and self-tour the nearby historic neighborhoods of Manila or venture on excursions outside the city with recommendations from our tour desk. The hostel is surrounded museums, old churches, art centers, the national library, parks, restaurants, bars and nightclub. The historic and bohemian neighborhood of Malate has a very vibrant nightlife. Robinson Place Manila Shopping is just one block away and the hostel is only four blocks from the Manila Bay coastline and boardwalk. 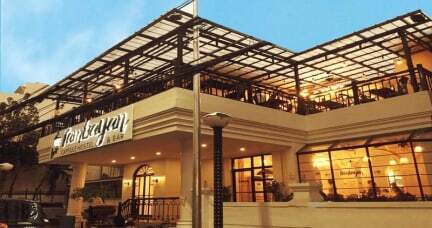 The property is 7.2 miles from Manila Ninoy Aquino International Airport and within 2 miles of Intramuros, Rizal Park and the National Museum. Tambayan Kitchen+Bar, our on-site terrace restaurant and bar, offers an innovative menu of modern Filipino cuisine boasting local produce and fresh ingredients. The terrace bar also features specialty drinks and inventive cocktails. Bath room facilities should be improved. Power sockets power halt without the room card. Suggested the power last at least 1 hr for equipment charging. Everything is fine but one thing, even very late, there are people who come in the room in the early morning, which leads me cant to sleep.